Awesome Custom Scrollbar is a Highly customizable custom scrollbar jQuery plugin for your WordPress website. 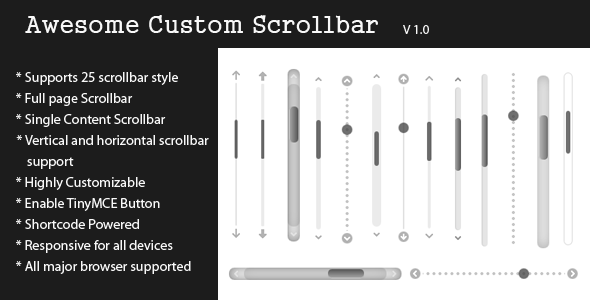 By this plugin you can customize your webpage scrollbar. And uou can embed Custom Scrollbar in a single content via shortcode in everywhere you want, even in theme files. You can change almost popular 25 scrollbar theme style, ScrollBar scroll speed, Showing ScrollBar arrow button mode, ScrollBar auto hide mode, ScrollBar auto expnad mode, ScrollBar moving mode by keyboard & other settings by using the options and shortcode of this plugin. For any help regarding this plugin, please feel free to contact me through my profile page and I’ll be glad to offer support. If you like this plugin then please don’t forget to rate it.